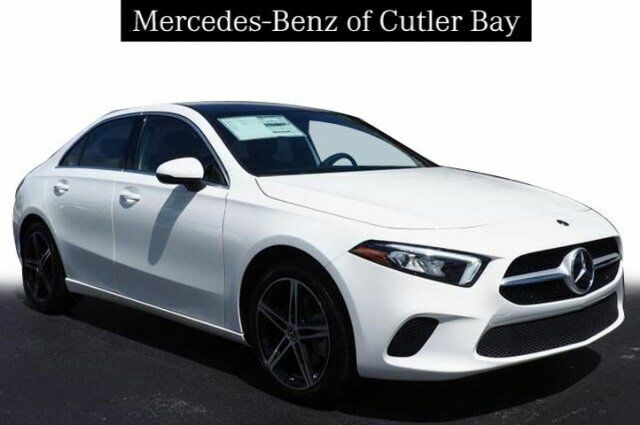 Irresistible in White, our 2019 Mercedes-Benz A 220 Sedan is built to exceed your expectations! Fueled by a TurboCharged 2.0 Liter 4 Cylinder that offers 188hp while perfectly paired with a race-inspired 7 Speed Dual Clutch Automatic transmission. This Front Wheel Drive A Class features Eco start/stop as well as Dynamic Select which allows you to drive according to your mood plus delivers brisk acceleration to 60mph in just 7.1 seconds and near 35mpg on the open road. Our 220 captures admiring eyes with its diamond-block grille, sweeping tail lamps, and unique alloy wheels. Inside our A 220, settle into an amazing interior that starts with heated leather highly adjustable front sport seats, upscale materials signify quality, powerful audio featuring a color intuitive central controller display to keep you informed. Pair your Bluetooth to stay connected and take note of top-shelf features including keyless start, dual-zone automatic climate control, wireless charging, and ambient lighting. You will love the Hey Mercedes feature. Advanced safety systems from Mercedes-Benz such as Attention Assist, Active brake assist, and a rearview camera offer you peace of mind as you enjoy the brilliant driving dynamics of our Sedan. Simply put, our A Class 220 provides superior performance and exciting design that you must see for yourself! Print this page and call us Now... We Know You Will Enjoy Your Test Drive Towards Ownership!